If only the Bible had produced the best possible results in this best of all possible worlds. We’re stumped that the deity who gave us this thousand-page book didn’t foresee some of the consequences. By some measures, of course, the Bible has been a big success; in terms of sales it ranks pretty high—supposedly the best seller of all time. And billions of copies have been handed out by Christian zealots. ‘Holy Bible’ is commonly printed on the cover, but does widespread veneration mean that it has been successful as a moral guide? Of course we can acknowledge the many positive outcomes of people following its best teachings. But that’s not the whole story by any means. I can think of at least five items that should be in the Bible that aren’t there: clear, unequivocal, easy-to-grasp prohibitions. With these missing—and with the quantities of human misery that ensued—it’s hard to take the Bible seriously as the best that could emerge from the divine mind. How could God have left out these commandments? • Thou shalt not engage in war. And if you do, don’t pray to me for consolation, support or victory. Don’t assume I’m on your side. • Thou shalt not enslave other humans. Ever. Period. • Thou shalt not despise and discriminate on the basis of skin color or location of birth. Ever. Period. • Thou shalt not discriminate against women. Ever. Period. In any way. • Thou shalt not discriminate against gay people. I made them that way, so get over it. Full disclosure, disclaimer: I am gay, and have reached the age that I have zero tolerance for aggressive, arrogant ignorance about sexual orientation. The majority of Christians are on board with the ignorance…and the hatred. Not only does the Bible leave out these prohibitions, there are many passages that encourage all of these sins that should have been condemned. And, wow, have we paid the price. God missed his chance to nudge humanity in the best directions. 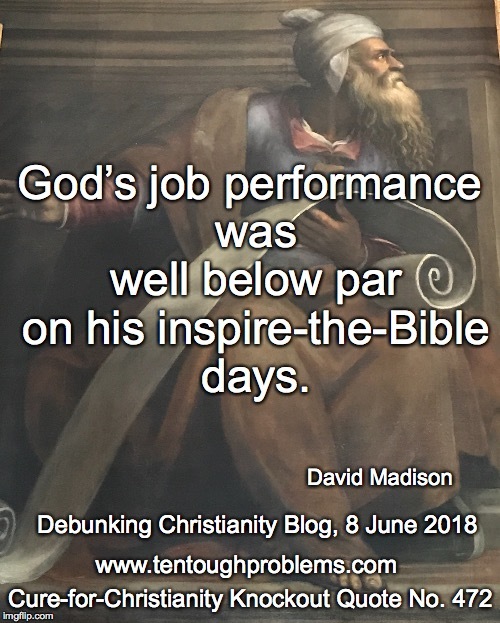 This is the fourth fatal flaw: despite all the hype to the contrary, the long-term impact of the Bible has been a mixed bag. It doesn’t show the quality we would have expected from God. In addition to these omissions, let’s also consider some Bible teachings that have done substantial damage. "But from the beginning of creation, God made them male and female. For this reason a man shall leave his father and mother and be joined to his wife, and the two shall become one flesh. So they are no longer two but one flesh. What therefore God has joined together, let not man put asunder." "And in the house the disciples asked him again about this matter. And he said to them, Whoever divorces his wife and marries another, commits adultery against her. And if she divorces her husband and marries another, she commits adultery. Let that sink in. Think of all the bad marriages that have taken place in the history of the world, across all the centuries and all the cultures. Consider all the bad reasons for which people have been married. But never mind, God gets the credit for all of them? And no matter how much human happiness could be rescued by ending bad marriages, no can do because God did the ‘joining’ in every case? Jesus makes it worse by adding that people who remarry commit adultery by doing so. This Bible text has brought incalculable human misery. The custodians of Catholic doctrine cannot admit that Jesus was wrong and won’t yield on its opposition to divorce. The gospels fall so far off the reliability scale that we have no way of knowing what Jesus actually taught. But the first three gospels pushed the idea that a ‘kingdom of God’ was about to be realized on earth, with Jesus as the ‘Son of Man’ playing the leading role (hence Bart Ehrman’s 2001 book is titled, Jesus: Apocalyptic Prophet of the New Millennium). This new kingdom was getting close, i.e., ‘before this generation passes away.’ Christians have been creative in explaining why Jesus wasn’t wrong about that too. But the apostle Paul deserves most of the blame for the end-is-near thinking that took deep roots in Christian thought. He was obsessed with the idea that Jesus’ descent through the clouds, to make everything better, could be only a matter of months away—or a few years at the very most. He fully expected to be alive to see it. All of the evil and misery of this world would be wiped way. "And when you hear of wars and rumors of wars, do not be alarmed; this must take place, but the end is not yet. For nation will rise against nation, and kingdom against kingdom; there will be earthquakes in various places, there will be famines; this is but the beginning of the birth-pangs." These events have been going on for thousands of years, so, hey, Jesus must be just around the corner—so bring it on…or so the evangelists hope. This is more truly bad fallout from the Bible. 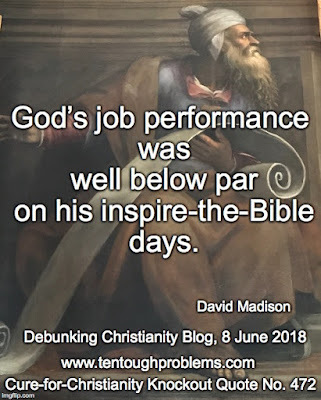 See also John Loftus’ article, “At Best Jesus was a Failed Apocalyptic Prophet,” in The Christian Delusion: Why Faith Fails. In the Book of Job, God makes a bet with the devil, and poor Job is used as a plaything, suffering horribly in the bargain. Satan shows up later to tempt Jesus in the desert; they have quite a conversation. In seems that Satan reigns over a dominion of demons, and they show up from time to time (especially in Mark’s gospel) to have even more conversations with Jesus; he usually makes quick work of them. The resurrected Jesus, in Mark 16:17, proclaims that baptized Christians have the power to cast out demons. It’s pretty clear that demonology has been part of the mindset from the very beginning, so it’s no surprise that today belief in evil spirits continues. Why not? It says so right there in the Bible. Do I exaggerate? The Vatican has a staff of exorcists. This is more bad fallout from the ancient text, holding people back from honest thinking about the Cosmos. It wasn’t too bright for God to include stories about devils and demons. Did the Enlightenment and the Scientific Revolution take him by surprise? Hector Avalos is right: 99 per cent of the Bible wouldn’t be missed. Why aren’t Christians appalled when they come across disturbing texts? Maybe because they’re gotten used to cult weirdness at the heart of their faith. I’ve asked this many times: why aren’t they nauseous when they read these verses (John 6:53-57)? "So Jesus said to them, 'Truly, truly, I say to you, unless you eat the flesh of the Son of man and drink his blood, you have no life in you; he who eats my flesh and drinks my blood has eternal life, and I will raise him up at the last day. For my flesh is food indeed, and my blood is drink indeed. He who eats my flesh and drinks my blood abides in me, and I in him. As the living Father sent me, and I live because of the Father, so he who eats me will live because of me.'" Whenever the focus shifts away from this noble sentiment to the quest for the right magical formulas, religion is cheapened. Priests and preachers for millennia have wanted people to ask, “What do I have to eat, drink, say and think to be saved?” The religious bureaucrats have the answers, and the Bible has been there to fuel the deception. But there is no magic book. And that, after all, is the thinking behind the concept of the canon: somehow God’s words were deposited there; all that’s missing in the magic wand. Once people are committed to this idea, and to their particular holy book, they can become fanatics. The stage is set for punishing and persecuting those who don’t agree. The very idea that a book contains God’s thoughts is a dangerous one, and we have seen some pretty horrendous fallout. Couldn’t God have seen some of the consequences of convincing people that his infinite wisdom is preserved forever on the printed page? Especially when the ‘infinite wisdom’ includes thoroughly bad ideas. It’s time to get over the Bible. There are a lot of other good books—much better books—that the Gideons could be giving away.